Imaging of living cells based on traditional fluorescence and confocal laser scanning microscopy has delivered an enormous amount of information critical for understanding biological processes in single cells. However, the requirement for a high numerical aperture and fluorescent markers still limits researchers’ ability to visualize the cellular architecture without causing short- and long-term photodamage. Optical coherence microscopy (OCM) is a promising alternative that circumvents the technical limitations of fluorescence imaging techniques and provides unique access to fundamental aspects of early embryonic development, without the requirement for sample pre-processing or labeling. In the present paper, we utilized the internal motion of cytoplasm, as well as custom scanning and signal processing protocols, to effectively reduce the speckle noise typical for standard OCM and enable high-resolution intracellular time-lapse imaging. To test our imaging system we used mouse and pig oocytes and embryos and visualized them through fertilization and the first embryonic division, as well as at selected stages of oogenesis and preimplantation development. 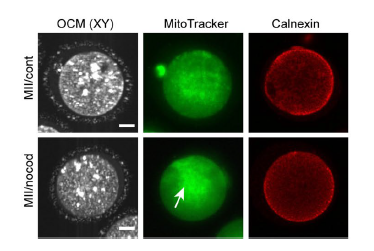 Because all morphological and morphokinetic properties recorded by OCM are believed to be biomarkers of oocyte/embryo quality, OCM may represent a new chapter in imaging-based preimplantation embryo diagnostics.